62 | Boating Industry | October 2016 www.BoatingIndustry.com /// Market Trends /// in deck boats today, so the stern drive segment remains an important part of the overall market." 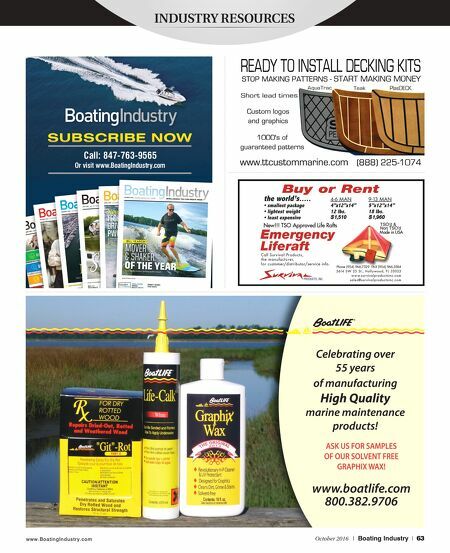 For Brunswick – itself a manufacturer of both outboard and sterndrive engines – the deck boat market represents a nearly ideal platform for dem- onstrating the benefits of both forms of power. "While we're pleased with the success of our outboard products, sterndrives still play a very significant role in the deck boat market," Schiek said. "We continue to invest in our stern- drive product line and we've enjoyed consider- able success with our sterndrive-powered deck boats among both Sea Ray and Bayliner buyers. Having purpose-built stern drives like the 4.5L MerCruiser V6 and the 6.2L V8 enhances the entire ownership experience, and makes the segment that much more attractive to a pro- spective buyer." 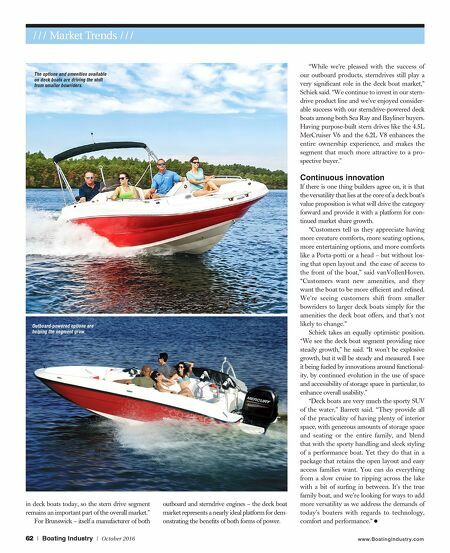 Continuous innovation If there is one thing builders agree on, it is that the versatility that lies at the core of a deck boat's value proposition is what will drive the category forward and provide it with a platform for con- tinued market share growth. "Customers tell us they appreciate having more creature comforts, more seating options, more entertaining options, and more comforts like a Porta-potti or a head – but without los- ing that open layout and the ease of access to the front of the boat," said vanVollenHoven. "Customers want new amenities, and they want the boat to be more efficient and refined. We're seeing customers shift from smaller bowriders to larger deck boats simply for the amenities the deck boat offers, and that's not likely to change." Schiek takes an equally optimistic position. "We see the deck boat segment providing nice steady growth," he said. "It won't be explosive growth, but it will be steady and measured. I see it being fueled by innovations around functional- ity, by continued evolution in the use of space and accessibility of storage space in particular, to enhance overall usability." "Deck boats are very much the sporty SUV of the water," Barrett said. "They provide all of the practicality of having plenty of interior space, with generous amounts of storage space and seating or the entire family, and blend that with the sporty handling and sleek styling of a performance boat. Yet they do that in a package that retains the open layout and easy access families want. You can do everything from a slow cruise to ripping across the lake with a bit of surfing in between. It's the true family boat, and we're looking for ways to add more versatility as we address the demands of today's boaters with regards to technology, comfort and performance." The options and amenities available on deck boats are driving the shift from smaller bowriders. Outboard-powered options are helping the segment grow.